Throw the Halloween wedding of a lifetime with these helpful pointers! Is Halloween one of your favorite holidays? Why not plan a Halloween themed wedding complete with spooky decor and pumpkins galore?! You can plan a scary evening for you and your guests or you can throw an elegant styled Halloween wedding. If you don’t want to choose just one, you can add a bit of both for a classic haunted celebration! If you are interested in having an October wedding that emphasizes on this haunting holiday, take a look at these great planning tips to help get you on the right track! Set up a table just for your seating cards if you plan on having specific seating for your guests. An appropriate spot for the table is right at the entrance so your friends and family can grab their card as they walk into the party. 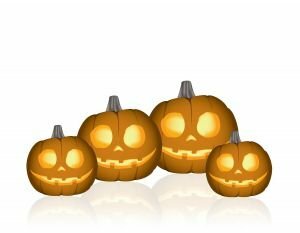 To represent your Halloween theme, have mini pumpkins or mini skulls laid out on the table with each card attached to them. You can choose one of these items or mix it up a bit and use both! Use the pumpkins for those who will be at a table with a pumpkin style centerpiece and use the skulls for the guests that will sit at a table with a centerpiece that signifies skulls. A creative centerpiece idea for a spooky Halloween celebration is a cage with a skull head inside. This may seem a bit dark but is perfect for the theme! Dress it up a bit by placing a candle or two inside or outside the cage. Use black lace to go around the candle jar so it gives off a dark yet romantic mood. Another fun centerpiece idea is a large pumpkin painted black that has the first letter of your last name carved into it. Then if you’d like, stick a candle inside so it illuminates the table. You can also use black chalkboard paint to cover the pumpkin and write on it with chalk, maybe even using it as a spot to put the table number! For more of a simple centerpiece, purchase tall vases to fill up with mini pumpkins. The vases can be purchased at a local dollar store and the pumpkins you can find at a pumpkin patch or at a nearby store. These are great to do on your own, which will also help keep some money in your pocket. If you want to add a little bit more to this centerpiece, surround it with fake spiders to scare your guests! Halloween is all about the eerie decorations so be sure to go all out and keep the theme going all throughout the evening. Start out by lining the aisle with carved pumpkins that have a candle inside of them to light up the walkway. You can carve the pumpkins with any design you would like, making some elegant looking and others scary! These will look great in photos and will impress your guests as you make your way down the aisle. When decorating your tables, why not use pumpkin table settings for each guest? Complete it with warm fall colors and a mini pumpkin at each seat. Some great fall colors to use are red, brown, orange and yellow. This will create a nice fall vibe while still symbolizing your Halloween theme. The food and drinks are an important part of your wedding day, so spruce up the food tables by adding lots of Halloween and fall touches. Set up a dessert table complete with candy treat bowls filled with lots of goodies and other desserts that are popular in the fall. To add more of a Halloween touch, hang a banner above the table that reads “Trick-or-treat!” Your guests won’t be able to resist the festive selection of treats! As for the drinks, cut the top of a large pumpkin and hollow it out before filling it with ice to use as a cooler. Set up a bunch of these pumpkin coolers, each filled with a different kind of beverage! Add some spooky lighting to your evening by filling up water balloons with water and a glow stick, then placing them inside a stocking to make for some ghostly lighting that will hang from the ceiling! These lights won’t be too bright and will set a romantic tone along with looking pretty awesome in photographs. The fall weather and Halloween come complete with chilly weather. Send your guests home with something that can warm them up on a cold night! Put all the essentials to the perfect hot cocoa and spruce it up a bit by putting it in a wand! Place all the wands in a cauldron that a witch would use to brew things up then place the pot near the exit so each guest can grab one on their way out. Another creative favor idea are mini caskets filled with candy corn! Satisfy your guests’ sweet tooth all while representing your spooky theme! Have a Halloween wedding idea you would like to share with us? Comment below! Subject: LongIsland.com - Your Name sent you Article details of "Tips to Planning an Eerie Halloween Wedding!"